Colorful artwork is drawn on the pavement by a man using chalk in downtown Toronto City. He sits on the pavement as he draws his art. A couple of people stand behind him with a bicycle at Yonge Dundas Square. His writings is seen on the pavement is also part of his artwork. Man drawing with chalk on the pavement in downtown Toronto City, Ontario, Canada. If you interested in more pictures of cities you should make sure to check out this collection of city pictures from several mayor cities around the world. 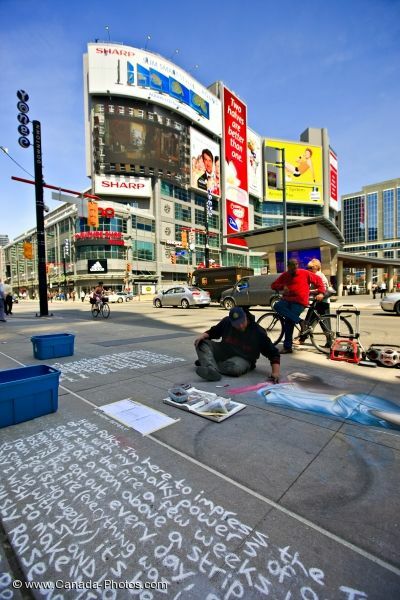 Artist draws with chalk on the pavement in downtown Toronto City, Ontario, Canada.